It’s that time of year when Christmas comes to town. October is finally over and retailers all over the world start to decorate their window displays with hundreds of fairy lights, baubles and tinsel. However, Christmas with one brand in particular is always something that little bit more extra special than others… Welcome to Jo Malone London, Theatre Of Christmas. Now I know I’m totally behind the time telling you all about Theatre Of Christmas because we’ve all known about this super special launch since the end of this Summer, but I thought I’d leave my write up until I’d experienced the collection, store events and products for myself. Watching the whole campaign over social media has been so exciting, not only because we all love new arrivals at Jo Malone London… but the story behind this Christmas collection. 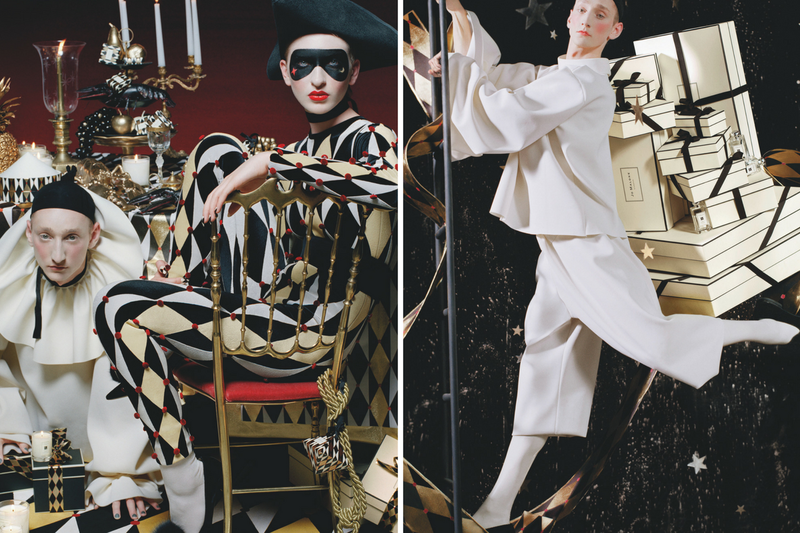 Theatre Of Christmas is inspired by the iconic Harlequinade Pantomime, showing true romance and mischief. The mystical tale tells the story of two lovers Harlequin and Columbine, which reflects the magic and mystery around this time of year. The iconic Harlequin print is continued through the packaging and products with shades of black, gold and white with hints of deep red. Something totally different in the history of JML. This magical story brings a new outlook to Christmas and fits perfect with the products and brand. This year is the first time JML have brought a limited edition cologne (scent) to Christmas. This amazing, warm fragrance is called Orange Bitters, made with hints of sweet orange, mandarin, amber and sandalwood. This is also available in a beautiful ceramic candle, a limited edition piece that’s utterly beautiful. The scent is unique and different, subtle and fitting to the season. I’ve been wearing the cologne for quite a few weeks now and no matter what day I wear it or where I go, I can guarantee someone will drop a complement. Giving someone the gift of Jo Malone London, is the perfect way to show your love this Christmas and what better way, than these amazing products all wrapped and ready to share. What’s your favourite Jo Malone product? Do you have your eyes on anything this Christmas? If you want to find out more about the magical Theatre Of Christmas, search the hashtag on Instagram! Previous Post October Round Up. Next Post Braun Series 9.